Currently, we cannot help you process this tourist visa. You will need to contact the embassy nearest you to get more information. Safe Travels! Iran is a large country in the Greater Middle East, and it is known as the former Persia. As you may very well know, the Persian Empire was vast, but as it happened with many other empires, it was reduced to what we know today. Nevertheless, it has a fascinating history that is worth learning about. Apart from that, you can do a lot of things in Iran that you may find exciting. You can go skiing near Tehran. There are 5 ski resorts there. Desert trekking is a favorite activity in Iran, and if you want to go swimming, the Caspian Sea and the Persian Gulf have some fantastic beaches. You can visit palaces, tombs of famous people, and ancient cities. Before planning the itinerary for Iran, it is best if you find out whether or not you need a visa to enter the country. According to the visa policy of Iran, 11 states are visa-exempt, which means their citizens can enter Ira without a visa and stay there for periods that vary from 15 days to 90 days, depending on the nationality. At the same time, a significant part of the world can travel to Iran with a visa on arrival. It is available to most nationalities in the world. However, it can be obtained only at specific airports throughout the country, and you already need to have an application when you get there. Even so, that is pretty easy. Only the citizens of 13 countries are not eligible for a visa on arrival, and they need to go to the nearest Iranian embassy to apply for a consular visa. The list includes the United States and Canada. To learn about the other 11, you can use iVisa’s Visa Checker. Select your country of origin in the left drag-down menu, and put Iran in the right menu. In an instant, the Visa Checker lets you know if you need a visa or not. 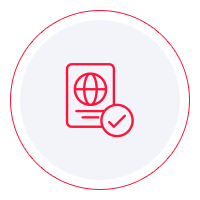 Moreover, if you do need a travel document, the tool provides a list of the nearest embassies. Simple, right? Since the government of Iran does not issue electronic visas, we cannot process a visa application at the moment. As soon as that changes, we will make the proper arrangements. Until then, you can use our support service to find information. It is free of charge and is available 24/7. As far as the requirements are concerned, you can find info online, but we think that the information you see on the internet should be used as a reference only. It would be better for you to call the issuing authority itself and ask your questions there. An embassy is always a more reliable source of information. That way, you cannot make any mistakes. On the other hand, we can tell you that the general requirement asks you to have a valid passport that does not expire for another 6 months from the date of your arrival in Iran. Also, women must have their head covered, scarves, long sleeves, and stockings. Otherwise, they are refused admission. Unfortunately, we cannot do more at the moment since we cannot provide a visa application process, but we hope that the information above is of help.